Do you know that eyeliner alone is enough for beautiful eye make-up? Of course you need to know how to use this cosmetic to do that. That is why brands vie with one another to create newer and easier eyeliners. One of them is Hi – Tech Eyeliner from Pierre Rene. What is so special about Pierre Rene Hi – Tech Eyeliner? First of all cosmetic catches attention with original look. Packaging shape is adjusted to female hand; resembles gun or cat’s claw. Pen is hidden under the tip, which prevents it from drying. On account of simplicity in use it is recommended also for people who just started using make-up. In white packaging fits 0,1 Oz of black waterproof liquid. Hi – Tech eyeliner stays on eyelids whole day, doesn’t rub or fade. In 100% is suitable for lines in all shapes and lengths. Cosmetic gives perfect cover and intense colour. It will fulfil every, even very subtle, eye make-up. What a shame that it is available only in black colour. How should you use Hi – Tech Eyeliner from Pierre Rene? For the cosmetic to last longer, apply on eyelids some make-up base and matt powder. Then gently tighten the eyelid and along the lashes line draw few dots – connect the dots and your line is ready. Now you can thicken it a bit, sharpen the “tail” or draw similar line on the inner eye corners. It is worth to know that in spring – summer 2016 season fashionable will be only lines drawn with eyeliner. Few other trends involve spots, blots and other patterns; and not only on the eyelids. You can use eyeliner also on a top eyelid and a brow ridge; great will be shimmering and brocade lines. 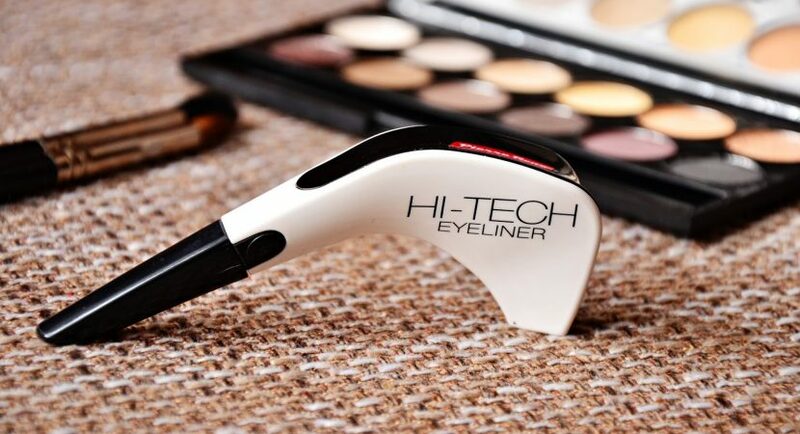 If you want to enhance your shimmering eye make-up, then on Hi – Tech Eyeliner from Pierre Rene apply cosmetic with shimmering particles by drawing another line or covering with it whole eyelid.